We have a few more pieces of information regarding the Xbox One to pass on, and while one will mark a new avenue for Microsoft’s system, the other may be seen as a step back. In a series of follow-up discussions with representatives for Microsoft, we discussed the possibility of ultra high-def 4K output, and how that would fit into the Xbox One’s plans. Running 4K resolution to a TV requires at least an HDMI 1.4 output. We haven’t heard the specifics on the Xbox One’s HDMI, but this seems to confirm that the console will use the higher level HDMI connection. If not, a conversion kit will be required. It is a moot point at the moment though. 4K games are more the province of theory than anything else, and most developers haven’t shown much interest in them so far. Sony has even confirmed that it isn’t focusing on 4K games with the PlayStation 4, though the console supports 4K movies. The technology simply isn’t ready for the mainstream yet, and costs are prohibitive. It may one day become the norm, but that day is far off. Still, the inclusion shows that Microsoft is planning for the future. Odds are that there will be 4K TV channels before there are 4K games, so the inclusion of 4K technology makes sense in the long run. Especially considering Microsoft’s obvious slant towards the television side of things in the next generation. 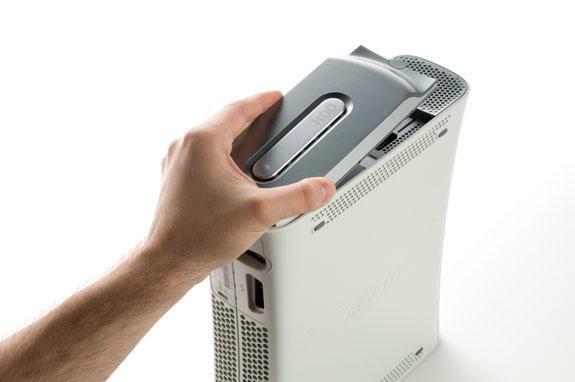 The other piece of news is a bit more disappointing: the Xbox One features a built-in hard drive, which means you won’t be able to easily upgrade it yourself as you can with the Xbox 360. 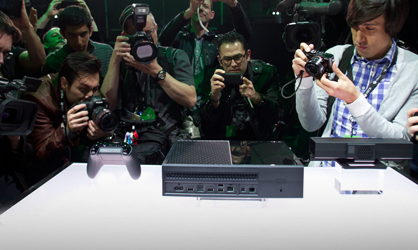 “Xbox One includes a built in 500GB hard drive and unlimited storage in the cloud or you can also add storage as you need it using a USB 3.0-attached external drive,” we were told. A 500GB hard drive may sound like a lot, but when you are dealing with games on Blu-ray discs that need to be fully installed on your hard drive, it really isn’t. Of the actual 500GB hard drive, there is a chance that at least 50GB will be partitioned off for various operating functions – the Xbox One does have three operating systems after all – leaving you 450GB to work with. A typical Blu-ray movie can range from 15 to 30GBs, while the discs themselves can store up to 50GB of information. For argument’s sake, let’s assume that a standard game is on the low end of that spectrum and call it 15GB, which is the size of some PC games today. If you only install games (and not video), you could fit around 30 titles, tops – again, assuming that the games are only 15GB, which seems unlikely. It is almost a given for a popular title to have DLC these days, and those expansion packs can each be well over 1GB per pack on the current gen. With a game like Call of Duty that releases four per year, that add up. On the next gen you can expect the size of DLC to increase as well, possibly double or triple what we’ve seen before. Take Mass Effect 3: the game and all of its DLC combine together to around 20GB of content. If that was a next-gen game sporting increased graphical fidelity, it is possible that number could double or even triple, just as the current size of games has during the life of the Xbox 360. Now imagine what games in three or four years will look like, once developers start taking full advantage of the hardware. Factor in digital-only indie releases and that 450GB disappears faster than you know it. This is in no way an insurmountable problem. The ability to use external storage is important if you want to store photos, music, or videos, but odds are that the Xbox One will require games to be installed on the internal hard drive. It’s speculation at this point, but PC gamers will tell you that playing games off an external drive hurts performance. The larger games become, the more of a problem this will be. All of this means that your non-removable Xbox One hard drive could run short on space very quickly.